Plant parasitic nematodes are microscopic roundworms that range in size from as small as 250 micrometers, or 0.0098 inches, to a maximum of several millimeters in length. It’s a parasite that Melissa Mitchum has devoted her career to fighting. Mitchum, a professor in the Division of Plant Sciences and Bond Life Sciences Center, has 20 years of plant nematology research experience. One of the greatest threats to crops lives underground and can’t be seen by the naked eye. Nematodes are extremely aggressive and adaptive. Some nematodes, like cyst nematodes, are picky … Expand ▸Nematodes are extremely aggressive and adaptive. Some nematodes, like cyst nematodes, are picky about which crops they infect. There are sugar beet cyst nematodes, potato cyst nematodes, cereal cyst nematodes and corn cyst nematodes, among many others. The majority of Mitchum’s research is on soybean cyst nematodes and their interactions with the soybean plant. Nematodes are extremely aggressive and adaptive. Some nematodes, like cyst nematodes, are picky about which crops they infect. There are sugar beet cyst nematodes, potato cyst nematodes, cereal cyst nematodes and corn cyst nematodes, among many others. The majority of Mitchum’s research is on soybean cyst nematodes and their interactions with the soybean plant. She has received multiple grants in the area of nematology, including one taking place at the Hundley-Whaley and Bradford Research Centers in collaboration with Hundley-Whaley Superintendent Jennifer Miller and Tim Reinbott, assistant director of the Agricultural Experiment Station. Soybean breeder Andrew Scaboo is also collaborating on the project. The trial is replicated at two sites – Hundley-Whaley and the Bradford Research Center, near Columbia. The study is funded by a grant through the Missouri Soybean Merchandising Council. 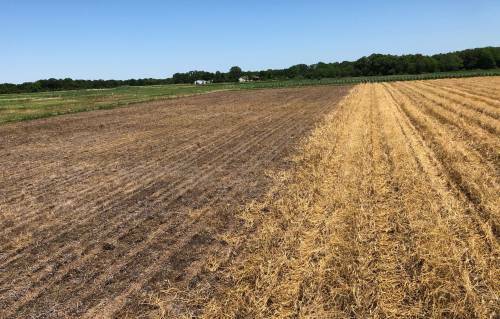 It is a cover crop study with a focus on seeing if cover crops, with and without seed treatments, can lessen the amount of soybean cyst nematodes in the roots. Miller is using two varieties of soybeans in the project – one variety is resistant to soybean cyst nematodes and one is not. They are using three cover crop systems: cereal rye by itself, cereal rye and tillage radish, and tillage radish by itself. Half of the soybeans are treated with ILeVO, a seed treatment known to protect against nematodes. The other half is not receiving treatment. Miller and Hundley-Whaley research assistants are taking numerous soil samples in the spring and fall. They are then delivering the samples to Mitchum and her research specialists, who are combing through each sample in her lab – SCN Diagnostics. 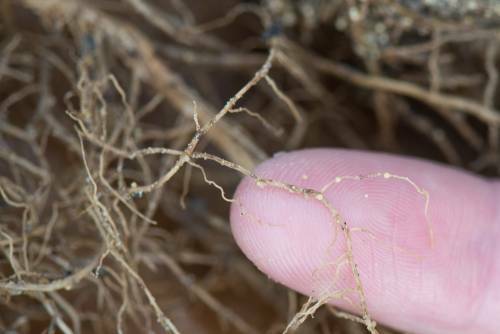 Soybean cyst nematodes set up a feeding site in the roots of the soybean plant. As the female nematodes go through their lifecycle, they swell and eventually emerge from the root as small lemon-shaped structures visible upon close inspection of the roots. The dead adult female nematode forms a cyst. Soybean cyst nematodes set up a feeding site in the roots of the soybean plant. As the female … Expand ▸Soybean cyst nematodes set up a feeding site in the roots of the soybean plant. As the female nematodes go through their lifecycle, they swell and eventually emerge from the root as small lemon-shaped structures visible upon close inspection of the roots. The dead adult female nematode forms a cyst. “The cyst encases hundreds of eggs,” Mitchum said. “This cyst breaks off into the soil. That is the survival structure, and it’s extremely hard to eradicate, as the cyst protects the eggs in the soil. You can have an empty field for 10 years, then go back in and plant new soybeans, and the eggs within those cysts will be stimulated to hatch into infective juveniles. Soybean cyst nematode causes more than $1 billion in soybean crop losses annually in the United States. Mitchum is attacking the nematode problem from all angles. Her research focuses on the molecular basis of plant-nematode interactions. She is doing research in the lab on both the nematode and the plant side of the interaction, taking that research to the field and working with farmers to battle the pest. One aspect of Mitchum’s research is studying spit, as she looks at the secretions delivered to the host plant by the nematode through a hollow mouth spear. She is coupling this knowledge with modern genome editing tools to come up with a plan to improve soybean resistance. The feeding structure developed by nematodes is highly specialized. They’re actively transforming root cells to support their growth and development. “We’re trying to figure out how the nematodes form the feeding structure in the root,” Mitchum said. “We have identified molecular mimics, which are nematode-secreted peptides, small proteins, that look and act like the peptides that a plant naturally produces to regulate its own growth and development. The study is funded by a grant through the Missouri Soybean Merchandising Council. It is a cover … Expand ▸The study is funded by a grant through the Missouri Soybean Merchandising Council. 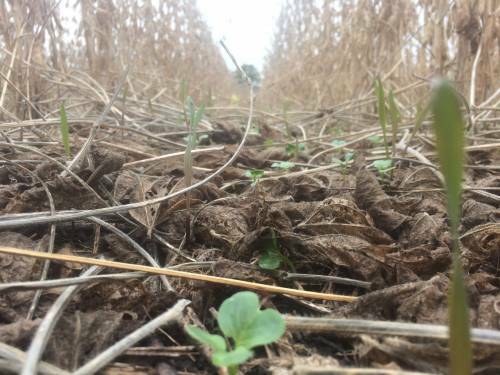 It is a cover crop study with a focus on seeing if cover crops, with and without seed treatments, can lessen the amount of soybean cyst nematodes in the roots. All of Mitchum’s research and teaching efforts have a common goal – to help seed and biotech industries, researchers, crop advisors and farmers fight nematodes. To do that, Mitchum launched SCN Diagnostics in 2016, serving as the director. SCN Diagnostics, an internal business operation at Mizzou, is in partnership with CAFNR and MU and provides timely, high-quality plant and nematode screening services to several parties. The focus is on soybean cyst nematode, but soil testing for other plant-parasitic nematodes is conducted as well. SCN Diagnostics offers plant phenotyping, soil testing and population typing. They work closely with farmers and crop advisors to help them identify if they have nematodes, as well as what type of nematode is present. The origins date back to research that Mitchum has been involved in since she began her research program at MU in 2003. SCN Diagnostics is completely self-supported. All revenues go right back into research. SCN Diagnostics has two research specialists – Amanda Howland and Clinton Meinhardt. Howland is the coordinator of the nematode testing, with Meinhardt coordinating the plant testing. John Chester serves as a part-time laboratory assistant as well.